Hey guys! I was born and raised in the city of Leicester in England, UK and moved to sunny Orlando, FL in 2004. I completed undergrad at the University of Florida in Microbiology and then went on to St. George’s University School of Medicine in Grenada. I was fortunate to move around and gain many perspectives during clinical rotations as a student, seeing different healthcare systems from NY, NJ, FL, to MD. 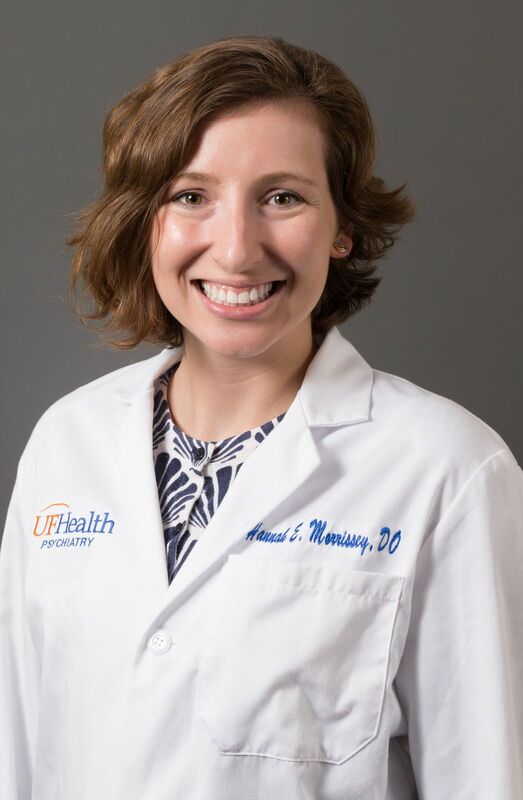 During these experiences, I developed my passion for psychiatry and solidified my path and now am ecstatic to having just started PGY2 at UF and so far absolutely loving it! I’m elated that you too have chosen to be a part of such a rapidly evolving specialty that truly encompasses the importance of interpersonal skill and perception in treating a patient effectively. One big personal reason why I chose UF was that Gainesville held some sentimental value and familiarity having done undergrad here. It was also the perfect balance with my significant other being an internal medicine resident here and my parents living in Orlando just a 2 hour drive away (makes picking up home cooked Indian food very convenient!). I knew a big part of residency is making sure you have your support systems in place when the work schedule can get busy and this allows me to do so. Multiple friends live around central Florida and so weekend trips to Tampa, Jacksonville, St. Augustine, and Orlando are very doable. The airports are also only a few hour drive away making it easy for weekend getaways. On a career choice/program level, the variety of teaching settings is what set this program apart for me. I’ve been amazed at the growth UF health has shown over the years, not just in psychiatry, but across the college of medicine. The new hospitals are completed and now open making big Shands even bigger Shands. There are many other specialties that you have the opportunity to work with in consult liaison roles. Being an academic flagship in FL with such a great reputation, you will see the most complex and interesting pathology and patient demographic, alongside getting a stellar educational experience with staff that want to be in teaching roles. This program also has fellowships within the department for extended educational and networking opportunities. This was also the only program I interviewed at that had it’s own psychiatric hospital, so you truly get a psychiatric inpatient experience. A final consideration which I cannot emphasize enough is that UF health is also affiliated with the Malcolm Randall VA Medical Centre across the street, meaning we get to see the veteran population as part of our rotations and/or call shifts. Seeing both perspectives of the private sector and the public sector, variety of pathology, treatment options/benefits/limitations, etc. really will lend perspective once you are practicing as an independent psychiatrist and I think its important to see both of these settings during training. I felt welcomed during the interview process, and so far have felt very supported by the staff attendings. You want to go to a program that can elicit your potential and challenge you to be more and so far am loving the journey. Currently, I am rotating on night float at Vista which is the psychiatric hospital. I work from 7pm and typically leave around 6am. The workflow is a steady busy with extended periods of down time to rest in the call room. Typically, responsibilities involve admitting patients through intake, and tending to ward issues. You work 5 nights Sunday through Thursday and get Friday and Saturday nights off which is nice for weekend plans.Daily schedules differ based on rotation, but typically inpatient rotations are from ~7.30am to 5pm. Consult-liaison services have similar hours whether at Shands or the VA. Evenings and weekends are free unless you are on call. Some months you may not have any call any weekends, at most I’ve had 2 weekends working and 2 off. I enjoy visiting my family in Orlando, or taking weekend trips. I enjoy going to restaurants and bars with friends here in Gainesville. Sometimes staying in and couching, using those days off to just catch up on my Netflix binging is always high on the option list. eat, relax, sing, bowling. And my dog is a Great Pyrenees. Hello everyone! I am Ashley Bindshedler. I grew up in West Michigan. For undergrad, I went to Grand Valley State University in Michigan where I played ice hockey. I went to medical school at Lake Erie College of Osteopathic Medicine in Greensburg, PA. I did rotations my 3rd and 4th year mostly in Ohio and Florida. I got married to my wonderful husband, David, at the end of 4th year of medical school. David and I wanted to stay in Florida but finding a program that was the best fit for us was our ultimate priority. I interviewed in several different states, both MD and DO programs. At my interview with UF, I was overwhelmed by how welcoming and friendly everyone was. I felt like the residents I met were very easy to get along with and I could easily see myself fitting in here. I also liked how UF help their residents excel, many residents are involved in research or a part of different national psychiatric committees. Plus, it seemed like Gainesville would be a great area for a newly married couple to explore. It depends on the rotation. Currently, I’m on urgent care, I arrive around 8:30 am, see a few patients in the morning, take lunch from 12-1pm, see patients in the afternoon and leave around 5 pm. Throughout the day, my attending will assign a patient for me, I do the H&P, present to the attending, order any labs or imaging that are warranted and either admit the patient or send them home. This rotation counts toward the medicine requirements that we need. This is a pretty low stress rotation. There is down time to read or study. Gainesville has so much to offer! David and I have checked out a lot of the breweries, gone tubing down Ginnie Springs, seen the bats fly out of the UF bat caves and played Frisbee golf at the local courses. Hannah (another awesome psych intern) and I run stairs at the stadium a few times a week. Gainesville is very dog friendly, so Halligan (our puppy) is able to come with us to a lot of places we hang out. We take him to Loblollywood Trail, Devil’s Millhopper State Park and even Swamp Head Brewery. We still have a few places we are interested in checking out like St. Augustine and Devil’s Den Springs. Hello! My name is Jessica Khan and I am originally from the great state of Iowa. I grew up in Des Moines, went to Iowa State University for undergraduate, and did my medical school training at the University of Iowa. I was very excited to come down to the sunshine state for my psychiatry residency. I chose University of Florida because of the supportive learning environment and the wide exposure to lots of areas of psychiatry. You see and do a ton during your training here at University of Florida, and I wanted to feel prepared for anything after residency. 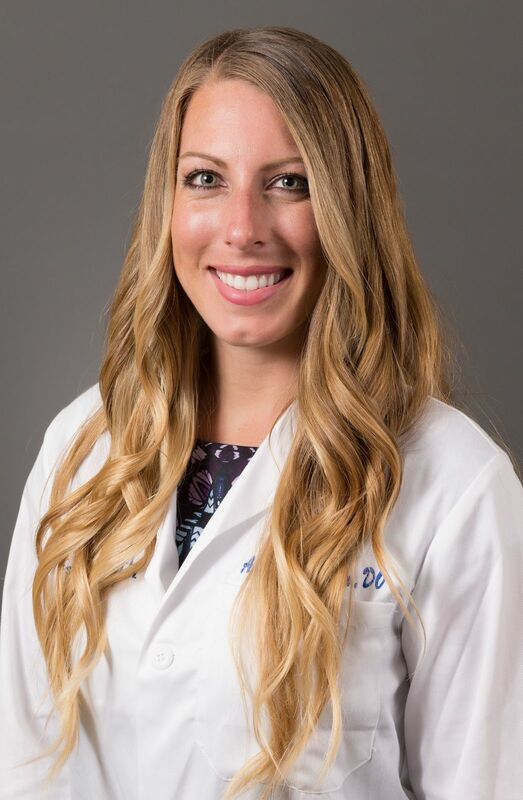 You get a lot of responsibility early on while having an incredibly supportive network of residents and attendings to help you navigate, and I thought this would be the ideal setting for me to learn how to be a skilled, independent physician. Also, I loved the residents! I felt like I belonged right away and could see myself being great friends and colleagues with the residents when I came for an interview. And now that I’ve been working with them, I’ve found I wasn’t wrong! My schedule this first year has allowed for an easy transition for me from medical school. I started with a month of outpatient pain and dermatology clinics followed by a month of ambulatory urgent care. Pain clinic gave me a great exposure to opioid usage and alternatives for pain management, which is a solid foundation for future substance use exposure. Both of these months provided ample free time in the afternoons and evenings, so I was able to study for Step 3 and take the exam in the middle of my second month of residency. It feels so good to have that exam done so early! My upcoming months will be more challenging on the inpatient units, but I’m excited to dive in! When I’m not at the hospital, I spend a lot of time with my husband and fellow residents. We love trying out a new restaurant, hanging at the pool, hosting a game night, or playing a disk golf course. Gainesville is in the perfect location for day trips to St. Augustine, Tampa, and Orlando and we have lots of free weekends to go exploring. I’d consider myself a Midwestern girl after spending the majority of my childhood in Peoria, Illinois. My dad spent 25 years in the Navy but we finally settled in Illinois after he retired to be closer to family. I attended a small private university there called Bradley University and then moved to small-town Kirksville, Missouri for medical school at A.T. Still University. I completed a four-week sub-internship here as a fourth year med student. I spent two weeks on our consult rotation and two weeks in child psychiatry. I LOVED it! The biggest influence was the residents I met and worked with. Everyone was friendly, willing to teach, and invited me on weekend adventures. I could see myself not only working next to them day-after-day but also becoming close friends. I also recognized the vast opportunities that the residents at UF get- working in several different locations and seeing a variety of pathology. I knew if I were to come to UF for residency, I would see it all and this would best prepare me for handling things on my own in the future. As a third year resident, I am in the outpatient clinic. I was very excited to finally have my own office to decorate! It is also an exciting time as you feel that your patients truly see you as their doctor and less so the attending. My day usually starts around 8am, when my first patient is scheduled. The last patient leaves around 5pm and after that I finish up any notes I have or respond back to phone calls and emails. On Wednesday afternoons, we have didactics for formal learning, but often I am looking up different topics on my own whenever I get a chance to during my clinic days. On Thursday afternoons, instead of seeing adults in clinic, I see my child-adolescent patients. Clinic is fast-paced and you soon become very efficient. I just recently had a baby boy! So naturally, a lot of my time is now filled with mommy things, which I love. My husband is a stay-at-home dad so usually on weekends, he cannot wait to get out of the house. Gainesville has a lot of things we enjoy doing, especially eating! With the university here, there is always some kind of festival or event happening. We also have two Boston Terriers that we love to take on long walks. We enjoy our apartment complex, but will often drive to one of the fancier neighborhoods nearby for our walks and “ooh and aah” at the new houses being built. I also spend a lot of time with the other residents, going to each others’ houses, parties (like Jessica’s annual Halloween party), or attending residency events. A big congrats to each of you as you begin your own residency journey! Please consider joining us here at UF, we’d love to have you! I am originally from South Florida, specifically the Delray Beach/Boca Raton area. I completed my undergraduate degree with a major in Biology and a minor in Health Science from The University of Florida. I completed medical school in Bradenton, FL at Lake Erie College of Osteopathic Medicine. 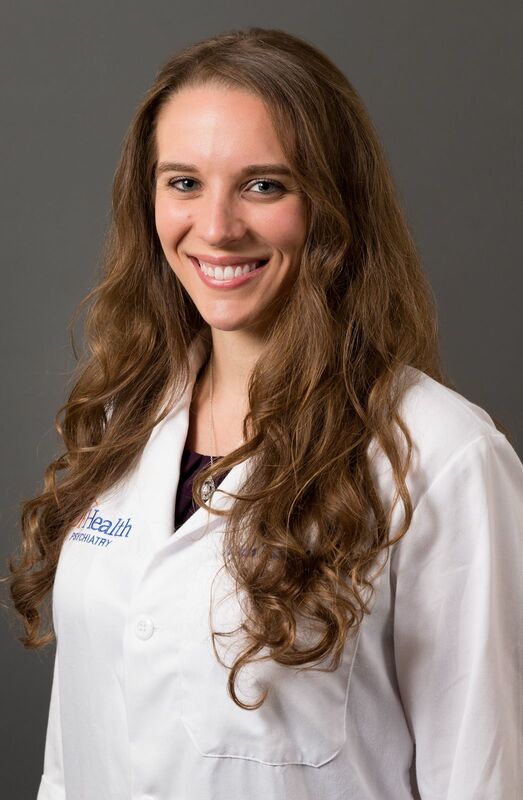 I moved back to South Florida during my 3rd and 4th years of medical school and finished a majority of my clinical rotations in Wellington, FL. After applying to numerous residency programs, I had interviewed at approximately 20 different programs, in 14 different states around the country. I had seen a wide variety of styles, program dynamics, and curriculum. UF offered me the best opportunity to succeed, overall. From the start of the interview I could tell that the program is incredibly organized. The staff behind the scenes do an amazing job keeping residents in the loop and updated on changes, required actions needed on the residents’ end and ease any anxiety a resident may have throughout the year. No other program came close to UF in that regard. The program offers a wide variety of rotation opportunities split between 3 different hospitals in Gainesville: Malcolm Randall VA Medical Center, Shands, and UF Psychiatric Hospital (Vista). The rotations range from Consult Liason Psychiatry, Inpatient Psychiatry divided up between mood disorders, psychosis, substance and geriatric psychiatry, Community, Forensic, Child and Adolescent, Outpatient Clinic. Additionally, we have the opportunity to experience nightfloat, but not in excess throughout the year. Our call schedule is extremely manageable and the call pool is relatively large, so I find myself being on call only 2-3 times per month maximum. For my own personal preference, I preferred to stay in the state of Florida. I have family currently living in the Gainesville area. Weather was a factor as well, considering I could not see myself surviving up north during the winter. I am familiar with the Gainesville area considering I completed my undergraduate degree in this city, so I did not have to learn an entirely new city from scratch. Completely depends on which rotation you are working at the time. Most rotations start at approximately 8 am. Some will begin team rounding on patients at 6:30-7:30 am. Some are more rigorous than others but for the most part I have not found duty hours to be a problem. I have rarely felt overworked during the past year. My daily duty hours never exceeded 14-15 hours and those days were few and far between. I did not feel underworked either. 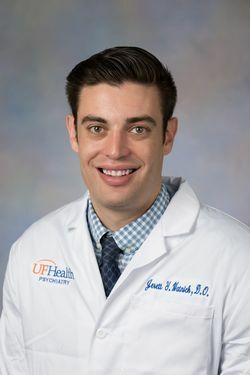 I feel that UF has found the perfect balance in resident exposure to patient psychopathology without excessive levels of stress placed on the resident. A couple days a week we will have didactic lectures during the lunch hour where food is provided to residents. Typically, didactics are clustered into one afternoon per week instead of spreading it out throughout the week. Usually those days are Tuesday (PGY-1) and Wednesday (PGY 2-4). For PGY-2’s we have an afternoon of outpatient clinic on Thursday afternoons where we are scheduled patients for psychotherapy, medication management and psychiatric evaluations. Most rotations end at approximately 5 pm, depending on if you have completed all of your daily duties. I am a huge Gator sports fan so I attempt to go to as many college football or basketball games as I can. I attempt to exercise as much as I can at the local gym. I am also an Orlando Magic fan and will try to attend a few games a year in Orlando, FL. I try to take time to go home and visit family in South Florida as much as possible. I have spent most of my life living in various parts of Florida, but was originally born in New York. 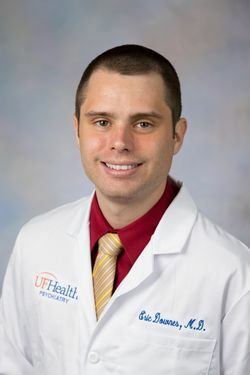 I attended undergrad at the University of Florida, then attended medical school at the FAU Charles E. Schmidt College of Medicine as a member of the inaugural class. I spent a year performing clinical research before entering medical school. I got married in medical school to my wife, and we couples matched to UF. She is currently a pediatrics chief, and we are both having a great time here in Gainesville! My wife and I chose UF because we wanted to stay in Florida close to family. Coming from South Florida, we were ready for a change, and UF provided the best compromise between seeing a unique clinical population and being within driving distance of family. I personally really valued the ability to rotate at both academic and VA hospitals. Matching as a couple, UF really went out of its way to accommodate us. It was one of the 2 locations that allowed us to book an interview the same day and stay in the same hotel despite us applying to different departments. The program is very family friendly, and the residents here seemed to have a good work/life balance overall. I have just finished my outpatient year as a clinic resident. During this year, I would see patients from 8AM-5PM (with half an hours or administration time and an hour for lunch). Current I am on an outpatient homeless/addiction rotation where I help facilitate recovery groups and visit the state hospital. During this rotation, I also rotate throughout helping hands clinic for those without insurance. My wife and I like to go out to dinner together and watch movies. I also enjoy hanging out with fellow residents, both in large group social settings and one-on-one.